The fillings were placed in two corn tortillas. 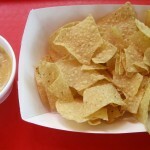 The corn tortillas are definitely healthier, but is also a little overpowering. The sausage and potatoes were good but lacked in flavor. The egg was nice and hot, and the cheese was delicious. It comes with pico de gallo on the side. Overall this taco was average, but lacked some oomph. We prefer the breakfast tacos at Torchy’s. Corn, tortilla chips, egg, cheese and pico. This taco ended up being less interesting than the previous one! If you are going to order this, definitely add some sausage or potato to spruce it up. The pieces of tortilla chips added a nice crunch. 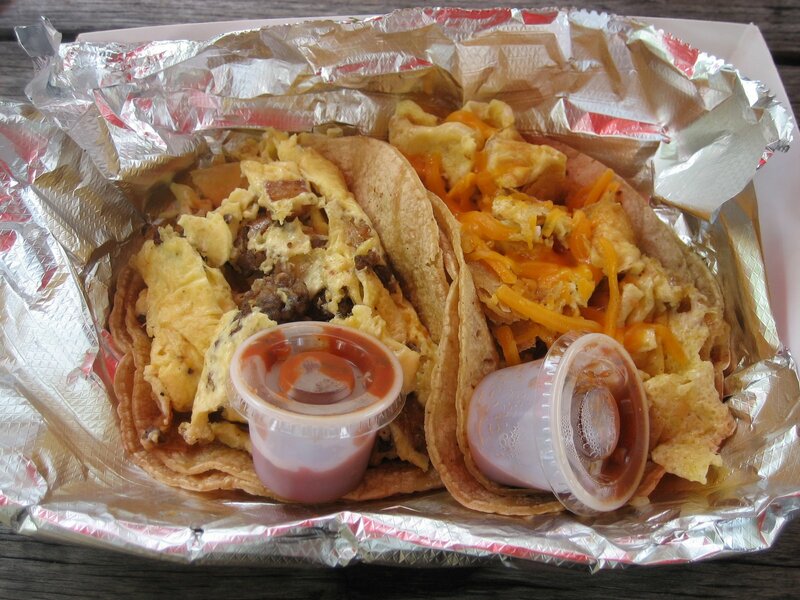 Again, nothing was wrong with the migas taco…it was just painstakingly plain. Next time we’ll try one of the more unique sounding tacos such as the Padre or the Fried Avocado. Yummy! By far the most delicious of the three menu items we tried. 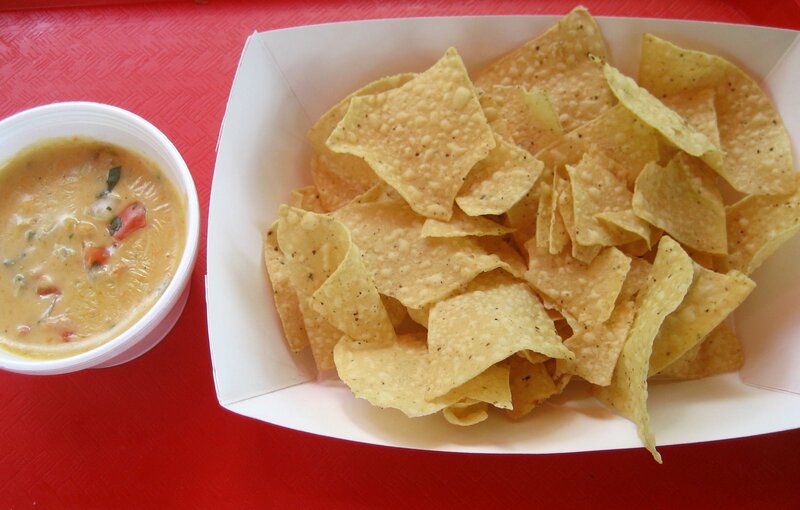 The queso was divine. It was chunky and packed the perfect amount of heat. Careful though – a few heaping mouthfuls might have you sweating a bit. The chips were nice and crispy. We could have ordered two of these and made a meal out of it! The owner happened to be the one taking our order. He seemed nice and efficient. He brought the food baskets to our table and chatted with us a little. We learned that he is a gourmet chef, and Izzos also offers catering and cooking classes. We can’t really say too much else of the service, other than it is pretty good. Izzos is located next to the Le Paris Creperie trailer on South 1st street. It is the very large, very happy blue trailer. Izzoz actually claims to have the biggest trailer in Austin, measuring in at 42 feet long! There are many benches with umbrellas available as seating options, as well as standing tables. Many of these are under trees which provide shade for those hot summer days. They also have stereo that provides some background music while you enjoy your food. Parking shouldn’t be an issue as there are plenty of spaces in the lot. Try one of the specialty tacos at Izzos and let us know which ones you like! The carne guisada tacos and vegetarian torta were outstanding. The fries were perfectly greasy with fried garlic bits on top.